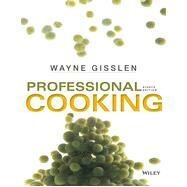 Professional Cooking continues to be the best-selling book for the introductory cooking courses in culinary programs. Gisslen’s provides a clear approach to explaining procedures and techniques, and then reinforces the learning through recipes. The 8th edition sharpens the focus on basic cooking methods and food science. Cooking methods have always been the emphasis of Professional Cooking, but the new organization of the text brings the basic procedures into a more prominent position, making it easier for instructors to teach these fundamentals. Methods are supported by an understanding of the principles of food science, which receives additional attention in this Eighth Edition. In keeping with this important trend, the revision of Professional Cooking includes expanded coverage of developments in sous vide cooking and molecular gastronomy.